The “Torre di Malta” Archaeological Museum was established in 1992 with the purpose of preserving the archaeological finds discovered during the excavations related to the city walls and the old town of Cittadella (Campo della Marta, via Roma, etc.) in the early 90’s. The building hosting the Museum is the renowned Torre di Malta, which was commissioned in 1251 by Ezzelino da Romano and which was later used as prison. 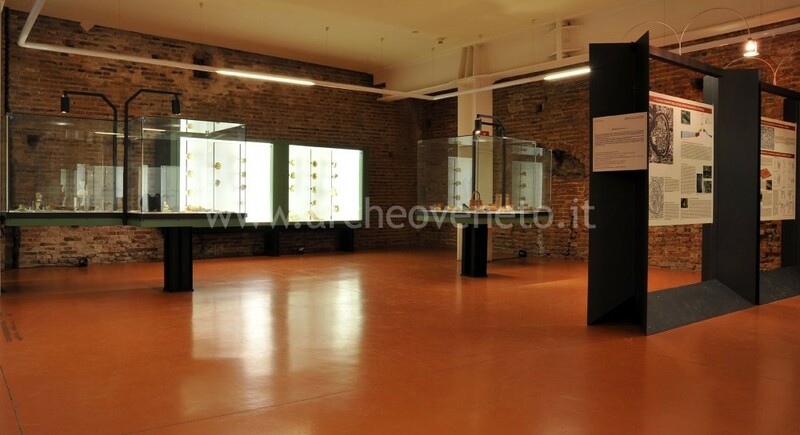 The items displayed mainly refer to two separate stages in the history of the old town of Cittadella: the Bronze age and the Middle Ages/modern history. The visit to the exhibition starts with large information panels placed in the middle of the room, which virtually divide the space into three chronological sections, referring to the main stages in the history of the area around Cittadella: prehistory on the right, roman Age in the middle and Middle Ages/modern history on the left. The panels turned towards the right present the studies carried out in the banked village of the recent Bronze age located in Cittadella as well as the one of the Late Bronze Age in S. Martino di Lupari. 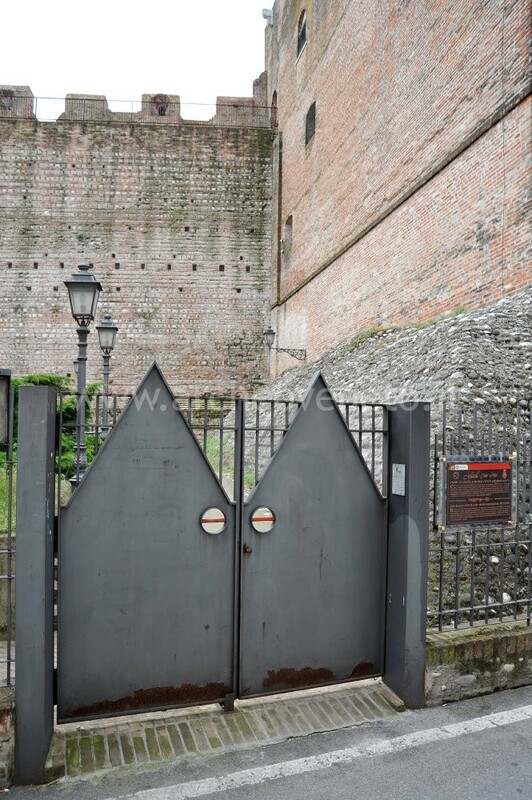 Both are examples of banked city walls for the defence of the village. The four central display cases contain the finds discovered in the most ancient of the villages, the one in Cittadella (14th-13th cent. B.C.). The majority of them consist of stone and ceramic artefacts: fragments of dolia and ollas, large bowls and truncated-conical pots, spindle whorls, loom weights, game pieces, querns and small querns in granitic rocks. On the wall on the right side there are two large display cases, which contain the materials found during the excavation in the banked village of “Le motte di Sotto” in Castel di Godego/San Martino di Lupari (13th-10th cent. B.C. 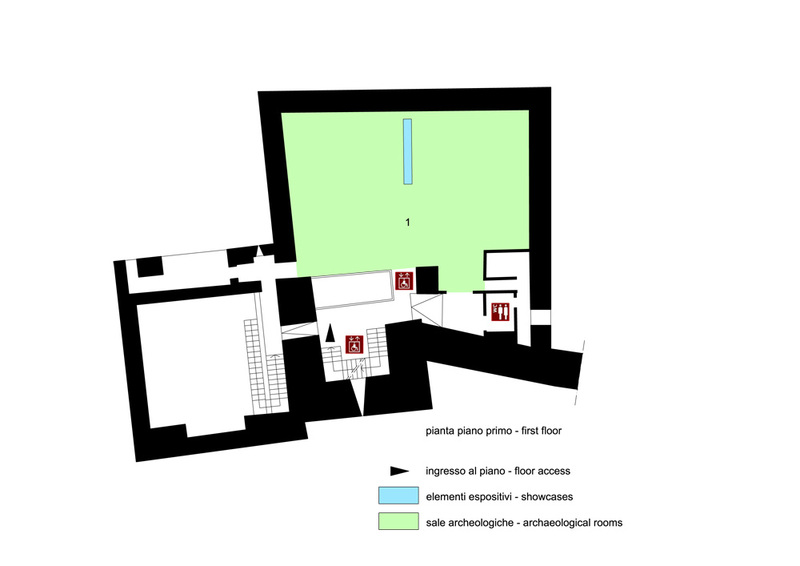 ): fragments of semi-finished clay pots, fragments of coarse clay cooking pottery, some artefacts related to the fields of culture and rites (such as a fragment of an anthropomorphic statuette), domestic tools (such as needles, spindle whorls and querns) and a small box room with bronze tools, including a chisel with quadrangular section stem (one end is sharpened and one is broken) and a stem with rectangular section with a hole for the handle and the two arms. Next to these items there are two objects coming from different places and dating back to different times: a bronze axe of the 13th cent. B.C., found in the bed of the Brenta river in the site Carmignano, and a large flint dagger of the Copper age (3rd millennium B.C.) from the area surrounding Cittadella. In the middle of the room there is an inscribed boundary stone of the Roman age (second half of the 1st cent. B.C.- first half of the 1st cent. A.D.) found in the bed of the Brenta river in the site San Giorgio in Brenta. The stone bears on the upper part the symbol of the Roman decussis and the reference to the three internal boundaries dividing the field into four areas (iussu terni limites); moreover the stone provides information on the distance from the Decumanus Maximus, which was via Postumia (sinistra decumanum VIII) and from the Cardo Maximus (ultra kardinem VII). In the left part of the room, there are many items dating back to the Middle Ages and the modern history. The specimens displayed are mainly pots in glazed, slips, graffito and maiolica ceramics, but also metal items (spearheads, nails, pins, rings and coins) as well as glass objects (bottles and glasses). Disabled access The museum is equipped with a lift. The building is provided with a large conference hall. Museo Civico di Cittadella nella Torre di Malta 1999. Bianchin Citton E., Cozza F. 2000, Il Museo Civico della Torre di Malta di Cittadella, in Quaderni di Archeologia del Veneto, XVI, pp. 200-202. Musei d'Italia, Guida Touring Club Italiano 2003, Milano, pp. 212. Bonetto J. 2009, Veneto (Archeologia delle Regioni d'Italia), Roma, pp. 400-401.